We’ve discussed the ARRA Weatherization Assistance Program a few times here at Texas Housers, focusing on perceived shortcomings creating local jobs in the low-income communities served by the program and our take on early news coverage of its “slow start”. While the Jan 21st Observer article is not available online, a selection of the monitoring reports reviewed by the Observer is available at Forrest Wilder’s blog here. TDHCA’s WAP webpage, which includes the latest production numbers is available here. As of 1/31/11, production stood at 26,743 units, or 79% of TDHCA’s goal. 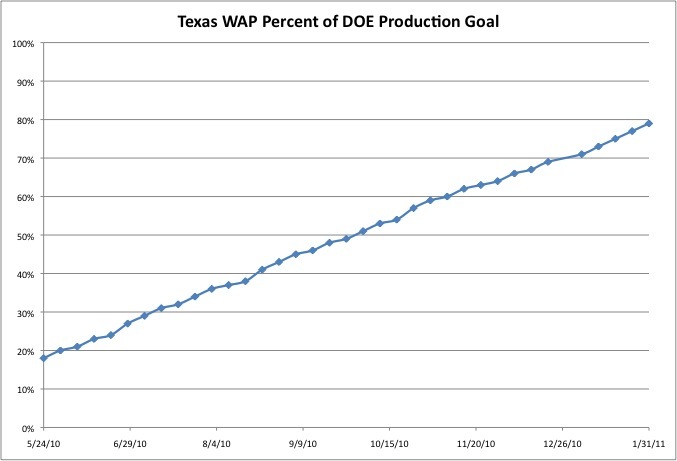 Below is a chart of the TDHCA’s progress since last May towards the DOE Production goal. This entry was posted in State issues and tagged ARRA, TDHCA, Texas Observer, WAP, Weatherization. Bookmark the permalink.